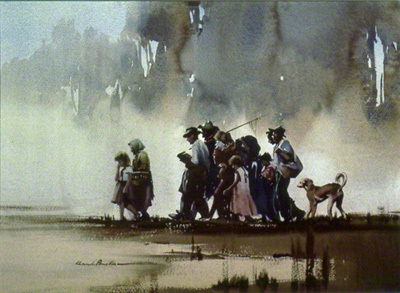 A water colour painting by Claude Buckle showing a group of refugees walking slowly from right to left. The figures shown are women, children and men as a large family group. There is also a dog trailing slightly behind adding interest to the painting. At the centre, a women is carrying a young child. Look for the head of the child just below the man carrying a fishing rod. Created in 1968.